Ruth Gerth’s 1931 “Glow Lamp” for Chase Brass and Copper Company is a gleaming example of American modernism with a bit of a dirty secret. The conical shade is topped by a globular finial and clips on to an incandescent bulb, nestled into its fitting atop a spherical base with a horizontal band running around its circumference. The entire object is chrome plated save for its black, Bakelite rotary switch. Although this design boasts an optimistic shine and clean, modern aesthetic, Gerth actually adapted the lamp’s base from a copper toilet float. Gerth grew up in Illinois and studied at the Art Institute of Chicago. From the age of seventeen she had a passion for industrial design and she ultimately became the first woman president of the Artists Guild, an organization devoted to the rights of freelance artists. Her most prominent client was the Chase Brass and Copper Company, based in Waterbury, Connecticut. She became an important part of the company’s identity, planning its offices, gift shop, and showroom displays for its Manhattan office at Chase Tower, now the Mercantile Building. Until the 1930s, Chase primarily produced copper and brass fittings for industrial clients; it entered the consumer market with designs by a number of modernist designers such as Russel Wright, Rockwell Kent, and Walter von Nessen. Along with these luminaries, Gerth helped situate Chase as one of the preeminent producers of American art deco metal objects, many of which were crafted from recycled plumping materials also produced by the firm. Chase’s art deco designers can be considered early proponents of upcycling, a design trend that really emerged towards the end of the twentieth century to give existing objects new life by creatively repurposing them in new and often surprising ways, elevating their artistic merit. Gerth’s Glow Lamp does just that by taking the toilet float, itself innately modern as a key component of indoor plumbing, and transforming it into a shining art deco object. The copper float also inspired another of Gerth’s designs, the “Niagara” watering can, and Chase copper pipes were chrome-plated and twisted into her Fiesta Candlesticks, also in Cooper Hewitt’s collection. Although Chase’s decision to reuse existing products and recycle surplus materials had more to do with cutting costs than environmental conservation, Gerth’s sense of economy, and her sense of humor, inspired a progressive approach to modern design and materials that continues to this day. The description and biography is interesting and well-researched. 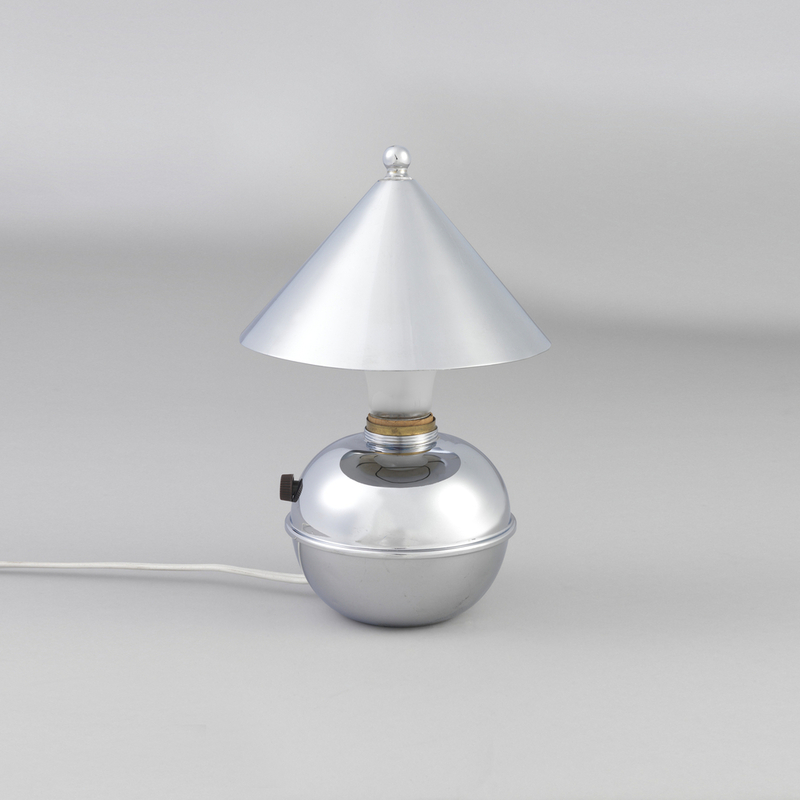 Glow Table Lamp, 1931. Designed by Ruth Gerth (American, 1897-1952). Chrome-plated metal, molded Bakelite. Gift of Mel Byars. 1991-59-109-a,b.